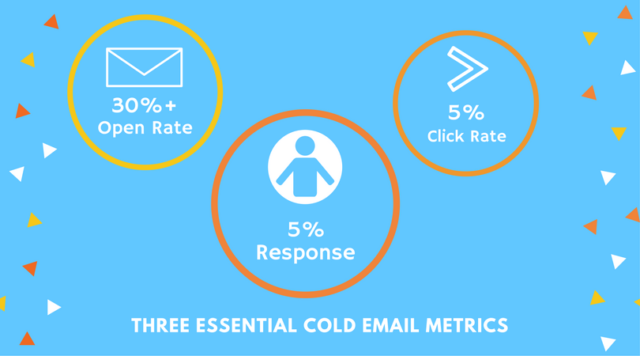 Use these tips to get more clicks and responses to your cold emails. Ok, it’s not just 2018. The cold email KPIs that matter now are the same as the ones for 2017 and even before then. What matters this year (more than ever before) is having the ability to improve your performance. We’re in a fascinating time. Communication itself is evolving at a breakneck pace. 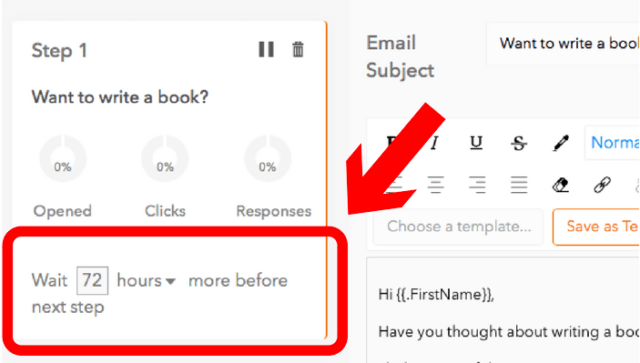 Mass personalized email has never been easier to send. CRMs, email marketing services, and specialty apps are now at the fingertips of any entrepreneur or business owner. The bad news? Every renaissance creates a flood of information. One second, few people are effectively using email. Then we wake up one day and everyone is talking about subject lines. How to improve KPIs over time. This is exactly what I hope to highlight in this post. I’ve seen tens of thousands of emails sent from the LeadFuze platform and there definitely is a rabbit trail you can find yourself on. Parsing through details that don’t matter won’t help you get more conversations with qualified leads. There’s a time for the details (more on that further down), but success and failure are determined by three metrics. Open Rate: The percentage of total recipients who open the email. Our successful clients are seeing around a 40% open rate, but you should be shooting for at least 30%. Click Through Rate: The percentage of total recipients who click through to an offer in the email. Getting these is all about the value you offer in your email. When done correctly, you should have a 5% click rate. Response Rate: The percentage of total recipients who respond to the email (either by reply or other means). Again, done properly, this should be at 5%. There it is, the big three. But that’s just the beginning. Knowing the questions on a test and the scoring system is a far cry from a passing grade. Getting a decent percentage in school is very similar to cold email. It will take study, practice, and testing. Now, let’s talk about how to improve your sales metrics. First, we’ll go over two general tips for improving any metric. Then, we’ll get specific for open rates and click-throughs/responses for a minute before we conclude. If you are only sending one email to leads, it’s not likely that you’re going to get any response, let alone a decent number of them. In fact, you should be using multiple methods of contact in many cases (but that’s a different story). Simply put, you have to send more than one email to get just about anyone’s attention. 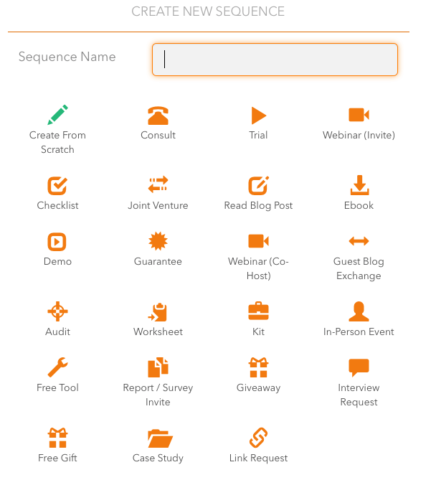 For this, you’ll need a sequence of emails sent in a cadence. You send your first email, then a follow-up within a day or two, then a couple days after that, and so forth. The sequence order and cadence can be tested for effectiveness, but we’ve found this general template (in the graphic below) to be a great starting point. If a lead doesn’t respond after 4-6 emails, wait a month and try again (hence the “30 days” email). Using a good tool is important. Most apps should have a timer of some sort. Here’s a screenshot of ours. The number one way to improve all of the KPIs is to constantly test something in your cold emails. One test at a time (as not to confuse results), but a test with each email. There are hundreds of potential tests you could run. 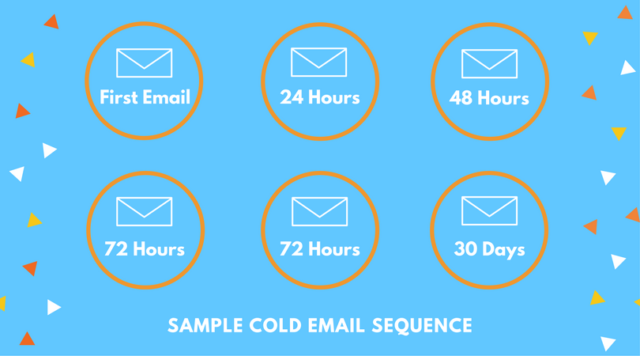 We recently put together a list of over 50 tests specifically for cold email outreach. You can find it right here. Important: It’s vital to have a good tool to keep track of the metrics. When people are opening/responding vs. when you send can give you valuable data as to the effectiveness of your tests. Here is a screenshot of the LeadFuze app showing the “events by hour” function. If you’ve sent cold emails before, it’s possible that you rolled your eyes when you read “40% open rates”. I get it, you may be hovering around the common results of 20% (maybe lower). And if that’s the case don’t fret — there’s hope. Here is a great way to increase your opens. Yes. Subject lines are still very important and you should have one that will entice the recipients to see what’s inside. Most know this, but many still don’t know that email recipients see (and often read) the first sentence of emails now. A great subject line can be blown by a bad first line. Start with the lead, not you. Instead of blathering on about who you are and what you’re pitching, give them something to think about or want. Here’s a screenshot of a couple of sample emails. I included good/bad subject lines, but I want you to pay attention to the text after those. Honesty Time: If you send the email, they know it’s you. Stop telling them that. And, if they open the email, they’ll see your signature at the end. Don’t include that in your first line. Take a look at the second sentence. The subject line mentions the company name and peaks curiosity. But the first line… That is what makes them want to them see what’s inside. It’s really like Gmail (and other ESPs) want to help marketers by giving them a way to drive people to see the last words of a sentence. Notice that the good example leaves just enough, but not enough. Key Takeaway: You have the subject line and part of the first line, use all of the real estate to your fullest advantage. Don’t waste space with your name. I’ll lump these two together for brevity. Once the email is open, the goal is to get leads to take action. Either click through to the offer available or send a reply email/setup a call. The best way to increase the number of CTRs and responses boil down to the same thing — Value. It’s all about filling your email with an offer that is so beneficial to the recipient that they want to download/email/call. It’s not easy and it takes putting something out there that may get you nothing in return. Vital Point: You can’t just send a cold pitch! There has to be a guide, webinar invite, or some other type of resource. If you’re a consultant in a highly sought after niche, it could be your time (which gets a decent response rate). A Human Resources SaaS app could offer a guide to changes in the law before open enrollment to HR professionals. Marketing agencies could offer templates, how-to whitepapers, free services, etc..
Just saying who you are and what you do is a first-class ticket to zero responses and clicks. But if you can get someone to click and review/use the resource, now you have a prospect that could be open for a cold warm call. At LeadFuze, our successful clients always offer something in exchange for the click or response. We’ve come up with 22 different offer types to help get your creative juices flowing and the conversation started. We are in a renaissance of communication. Everyone can mass email now. Hopefully, this post has made you realize that it’s not hard to stand out in a crowd. 90% of sales emails aren’t doing anything, but attaching a catchy subject line to a crappy message. If you test your outreach and monitor the 3 major KPIs, you will see results that the 90% will never attain. 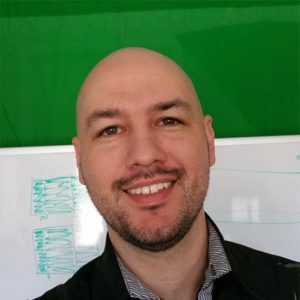 Justin McGill Justin is the Founder of LeadFuze, a solution to automate sales prospecting and engagement.